an aerogel is best described as jelly sans the moisture. 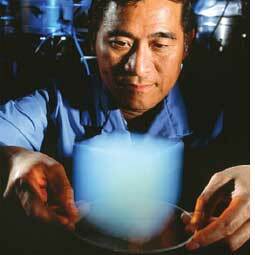 But unlike jelly that dries up and cracks when water is removed from it, aerogels do not crack. They are like sponges with a surface containing millions of nano-sized pores that can absorb anything--dust from air or mercury from water--making them great at pollution control. A team of researchers decided to look for the ideal aerogel pore size that will maximize absorption of oil from polluted water. Jose Quevedo and other researchers from the New Jersey Institute of Technology, US, kept aerogels with pore sizes between 500 and 850 m in a chamber. Contaminated water was made to flow downwards towards the aerogels. The oil particles were absorbed by the nano-pores. The experiment showed that the smaller pores filled up with oil with greater efficiency when the water was flowing at a slower speed. Oil concentrations of about 2000 mg/l in water could be reduced to less than 10 mg/l using this procedure. It is the way in which aerogels are prepared that makes them hydrophobic. They are made by absorbing water from silica gel using acetone. The acetone is removed using liquefied carbon dioxide. The preparation is heated till carbon dioxide turns into a gas. The gas is released, leaving behind a solid in the form of an aerogel. This unique method of preparation gives it an affinity for oil. Large amounts of wastewater containing oil are released by industrial companies daily. Oil degrades very slowly and sewage processing plants are not very effective. In some cases, as from the waters of the Yamuna, oil is extracted manually by the poor work force in that area (see 'Look, oil', Down To Earth, March 31, 2005) and sold to oil collectors. These are the fields where the aerogel technology can be useful. The concept of aerogels is yet to catch up with India. "The efficacy of aerogels in treatment of effluents is yet to be studied in India, said T Rajaram, Sastra University, Tamil Nadu.